A haircut provides two important functions – one of them is reshaping of hair after regrowth and removing of split or dead ends. Some people prefer to cut their hair in professional hair salons or barbershops, but some other people prefer to cut their hair at home by themselves or by their relatives in order to save their time and money. Needless to say, that hair cutting at home requires many hours and times of practice to be able to cut the hair in the same quality as it is in hair salons. Nowadays many amateurish hairdressers and even professional hairdressers think, that the length of their hair cutting shears should be determined by the size or length of their hand. Actually it does not matter – instead of measuring your hands you should consider variety of different hair cutting techniques that you are planning to practice. Hair cutting scissors are still measured in inches, taking into account their entire length which is usually calculated from the points to the back of the finger ring. As mentioned before, different length shears are used to perform different hair cutting techniques, for example, short shears are suitable for detailed precisions hair cutting, but longer shears are suitable for powerful hair cutting. 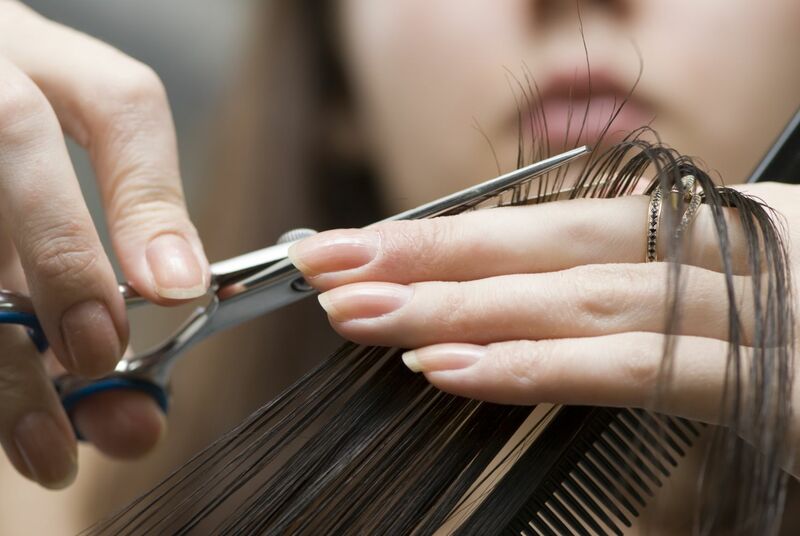 The standard size of hair cutting scissors most hairdressers are using is between 5 and 6 inches, because this length falls into the middle between the longest at 7 inches and the shortest at 4.5 inches. Ideally, of course, if you can afford it, it is best to have one pair of short shears (5 or 5.5 inches) for precision cutting and one pair of longer shears for different hair cutting techniques which are listed below. Bob-line cutting. During cutting of “bob-line” the hair needs to be combed down against the neckline. In this case longer shears allow hairdressers to make fewer cuts to cut the line all the way across, namely, longer blades provide smoother cutting line and significantly reduce the time which is needed to create a “bob-line”. Cutting on the skin. During cutting on the skin longer scissors allow hairdressers to cut longer sections and get smoother look more easily. Also hair cutting shears with crane handle help during cutting on the skin, because they lift the hand away from the body, allowing to cut freely and comfortably. Scissors over comb. Usage of comb helps to pick up a wider section of hair than fingers, therefore, usage of comb during hair cutting requires less effort and less time. Slide cutting. Slide cutting with shorter blades may be complicated and time-consuming, but these inconveniences can be eliminated with longer blades, because they allow to slide blades into the hair without moving the hair with other hand. Cutting around the face. If you use short shears during cutting around the face, your hand surely is in your clients face and in some cases a finger rest of your shears is dangerously close to its eye. Usage of longer scissors allows hairdressers to cut their clients hair with their hand at comfortable distance from their face. 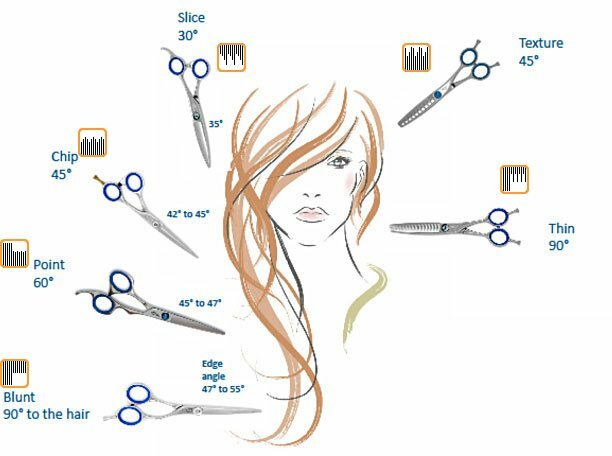 Benefits of longer shears during cutting around the face are that not only your client has much more comfortable experience, but also you can see what you are doing, allowing to perform your work more precise and qualitatively. Precision British cutting or so called Sassoon cutting. Haircuts in this technique feature masterfully executed precise edges, layers and blending which are most notably recognized in geometrical cuts, but they are also the foundation of well-executed cuts of all shapes. Standard British cutting or pivot point cutting. These hair cutting techniques have developed after classic Sassoon cutting techniques, therefore, both of them are standards for most cosmetology schools. French cutting. French hair cutting includes the hair’s natural movement in combination with easy styling. The haircut is created in direct coherence to the client’s bone structure and is emphasized with texture accents to to add natural look. Razor cutting. Razor cutting is not frequently used hair cutting technique, because it requires a lot of confidence and professional skills. Razor cutting includes usage of fresh blades for haircut which leaves the hair soft on the edges. Razor cutting is perfect to get wispy style or to make coarse and stubborn hair more manageable. Dry cutting. Dry cutting is suitable for curly hair and hair which is fine, because it allows the hairdressers to observe the natural movement and weight distribution in the hair. Clipper cutting. In general clipper cutting is associated with men’s hair cutting with electric clippers. Those hairdressers who offer clipper cutting are skilled in “scissors over comb” cutting, where the comb is used to hold and guide the hair instead of fingers. Generally there are four types of haircuts – 0 degree, 45 degrees, 90 degrees and 180 degrees. All of these specific angles are used to create a desired haircut. 0 degree cut is known as the cut blunt or bob cut, 45 degrees cut is known as the wedge, 90 degrees cut is known as layered haircut, but 180 degrees cut is known as the shag. Blunting is performed at 90 degrees to the hair, pointing is performed at 60 degrees, chipping is performed at 45 degrees, slicing is performed at 30 degrees, texturing is performed at 45 degrees, but thinning is performed at 90 degrees. Hair requires regular and frequent cutting and trimming to stay healthy. As hair regrowth is the most evident for people with short haircuts, hair cutting every 4 to 6 weeks is significant, while people with long haircuts can cut their hair every 8 to 10 weeks.